Cosmetic add-on for Immersive Engineering. 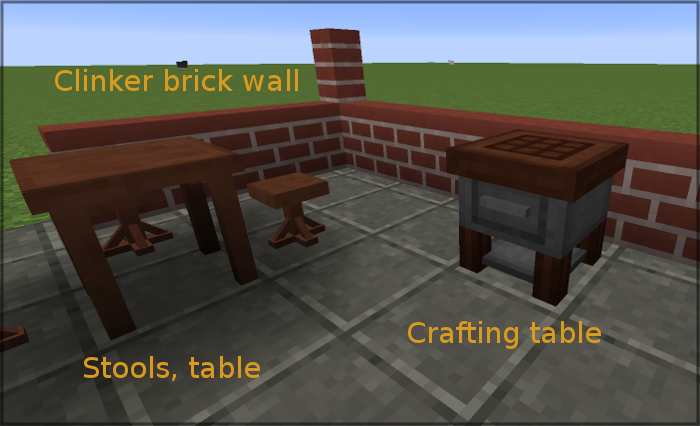 Treated wood crafting table: 3x3 crafting table with IE style GUI and a model fitting better in the engineer's workshop. Keeps its inventory (also as item), has eight additional storage slots on the left side of the crafting grid. 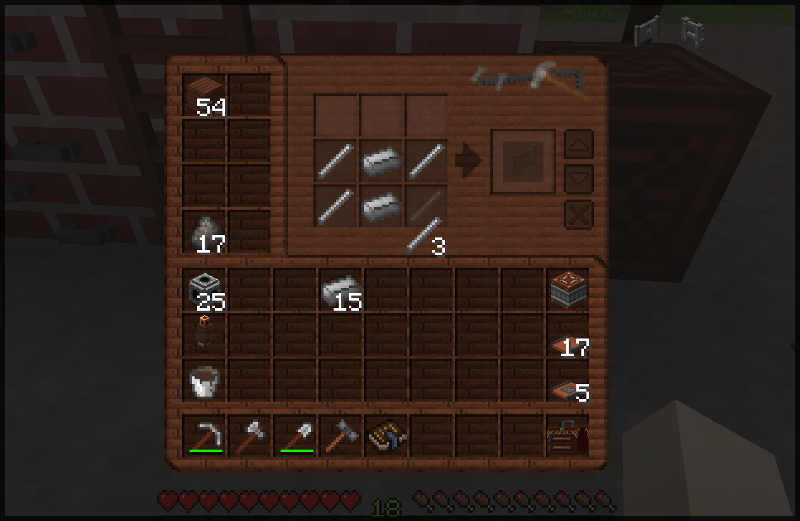 Crafted 2x2 with three treated wood planks and one vanilla crafting table. Small laboratory furnace: Solid fuel consuming, updraught. Slightly hotter and better isolated than a cobblestone furnace, therefore slightly more efficient. Has internal hopper fifos for input, output, and fuel (two stacks each). Two auxiliary slots (storage tray). Keeps inventory when relocated. Crafted with one cobblestone furnace, one hopper, and seven metal plates. Increased smelting speed when a IE external heater is placed in a aux slot. Rebar (steel) reinforced concrete: Expensive but creeper-proof. Crafted 3x3 from four concrete blocks and five steel rods. Texture design oriented at the IE concrete, slightly darker, eight (position dependent) random texture variations with rust traces. 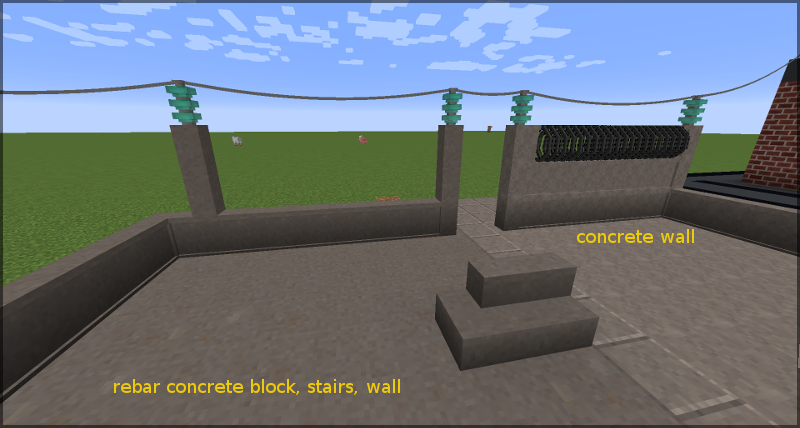 Also as stairs with the usual stairs recipe, and as tile, crafted 2x2 with four rebar concrete blocks. Concrete wall and rebar concrete wall: Solid barrier design walls (not like vanilla walls). Crafted 3x3 with six blocks (the usual wall-recipe). Clinker bricks: Slightly darker and more colorful version of the vanilla brick block. Eight position dependent texture variations are implemented to make the wall look more "alive". Crafted 3x3 with a brick block in the centre and any combination of bricks and nether bricks around (actually, anything where the ore dictionary says it's a "brick ingot"). Higher explosion resistance than the vanilla brick wall. Also available as stairs, and wall, crafted as usual. There is a reverse recipe to get three clinker brick blocks back from four stairs. Slag bricks: Gray-brownish brick, also eight texture variations. Crafted 3x3 from slag in the centre and any kind of bricks ("brick ingot") around. Has a higher explosion resistance than the vanilla brick wall. Also available stairs and wall, also with reverse recipe. 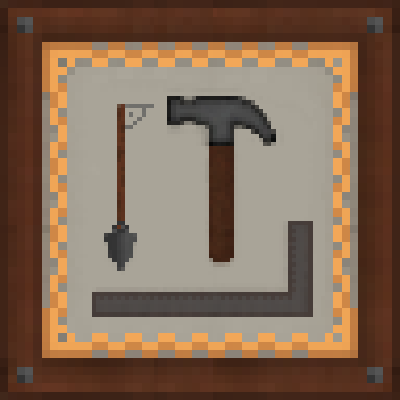 Treated wood ladder: Crafted 3x3 with the known ladder pattern, items are treated wood sticks. Climbing is faster than vanilla ladders when looking up/down while climbing/descending. Metal rung ladder: Industrial wall-fixed ladder with horizontal bent rods. Crafted 3x3 with five iron or steel rods in a "U" pattern. Also slight climbing speed boost. Staggered metal steps: Industrial wall-fixed sparse ladder with steps in a zip pattern. Crafted 3x3 with six iron or steel rods in a zip pattern. Also with speed boost. Panzer glass: Reinforced, dark gray tinted glass block. Explosion-proof, expensive. Faint structural lines are visible, multiple texture variations for seemless look. Crafted 3x3 with four metal rods, four glass blocks, and one diamond. Treated wood table: Four leg table made of treated wood. Crafted 3x3 with three treated wood slabs and four treated wood poles. Guess the pattern. Treated wood stool: Simple decorative stool. Crafted 3x3 with three treated wood slabs and one wood pole. You can sit on it, and so can zombies. Windows: Treated wood and steel framed variant, tripple glazed glass. Well isolating. Treated wood windowsill: Decorative block, not a shelf. Treated wood pole: Pole fragment that can be placed in all directions. It does intentionally not connect to posts, fences, etc - just a straight pole. Can be used e.g. for structural support or wire relay post, where the height of the IE wire posts does not match. Foot and head pieces available. Inset spot light: Small metal framed glowstone based light source for ceiling, wall, or floor. Light level like a torch. Thin, hence not blocking the way. Allows illuminating places where electrical light installations are problematic. More to come slowly but steadily. Packs: If your mod pack is open source as well and has no installer, you don't need to ask and simply integrate this mod. Bug reports: Yes, please let me know. Drop a mail or better open an issue for the repository. Pull requests: Happily accepted. Please make sure that use the develop branch for pull requests. The master branch is for release versions only. I might merge the pull request locally if I'm ahead of the github repository, we will communicate this in the pull request thread then. The mod config has an "include testing features" option. Enabling this causes blocks under development to be registered as well. 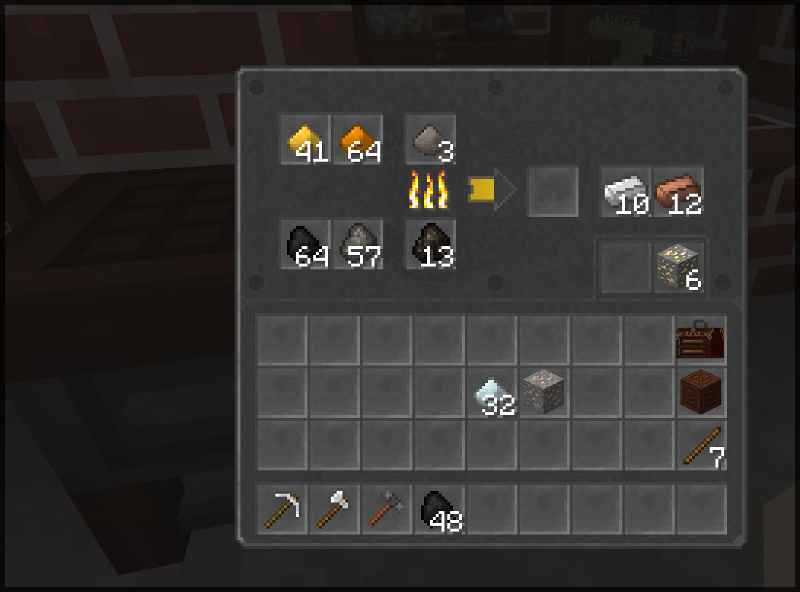 Immersive Engineering: Without IE, my little mod here does not make much sense ;). It works without IE, but quite a few blocks are not craftable. 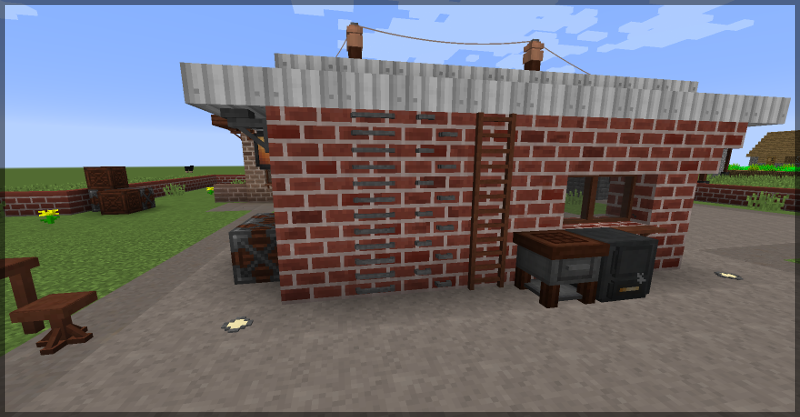 Engineer's doors has brilliant doors, trapdoors, and fence doors, all made of the IE materials. Dirty Bricks applies position dependent variations to the vanilla bricks, similar to the clinkers and slag bricks in this mod. Chisel needless to say, Chisel has a variety of factory blocks. Immersive Petroleum has asphalt concrete that fits brilliantly for floors. In reply to colormaxs: Hi, not sure that you mean, can you open an issue on the github and add an image? : Think I know what you mean now: you can't see the faces on the inner sides - that is intentional. When connecting these glass blocks it should look like one surface. The normal use case should be to have it as one big face in the floor, the ceiling, or the wall, so you don't want to seen the sides there. In reply to Cybercat5555: Worked, so the walls have now texture variations, too. Quick question, I placed an external heater into the aux slot on my lab furnace but it doesn't work. Do I also need fuel besides the heater? If so that seems a little counter to the purpose of the external heater and how it works with a vanilla furnace. In reply to Sixdd: Cheers man, glad to here' ya in the IE boat. IE's a brilliant master piece with the whole engineering context idea, and I also like all the mods fitting in this context. Let me (I suppose you probably know them already) recommend the mods that I put in the community references section: Imm. petroleum, tech, doors, etc. They also complete the IE fun for me. Oh no. Something has happened to the windows in the latest update. I'm getting the black and purple default texture instead. Eek! In reply to Boiks: Oh that doesn't sound good, can you open an issue on the github (please also specify the mod version (with MC version) and if you have optifine, although I downloaded the 1.12.2-1.0.3 from curse and checked on my machine with optifine, looks good there). If optifine, can you play around with the settings to see if there are changes? Or the game log should say something like "bla bla texture missing engineersdecor". At the moment I have no clue what it can be. Not using OptiFine and using latest version. Will open up a GitHub issue. Thanks! In reply to Boiks: Perfect, cheers. In reply to Dimentive: Thanks, glad you like it! I have a suggestion - could we get more types of Drillheads for the IE drill? I find myself with a surplus of various types of metals without much use and have been looking for ways to expand upon their usage. Could we get, say, Copper, Soulforged Steel (Better With Mods metal) and other various types of metals to get drillhead variants? Just brainstorming. In reply to xorbah: Hi, thx man. I'll put this one on a BS-list for a tool mod which I may start when gauges, switches and decor have are proper, complete feature set. Cheers. Would be awesome if there was a sort of early game ore doubler that required constant attention to run, similar the the AE2 grindstone. In reply to Voxel_Friend: Thanks for the input, I'll have to think about it - in this mod my basic idea is to add some things to the IE context, which are not there yet. Now, adding some kind of ore duping device would probably duplicate the IE Ore Crusher - even if it is not as powerful as the crusher. Ladder is comparatively early game, too. So, it might be hard to create a device that is good enough that people want use it in the very beginning, but inefficient enough that the ore crusher is not e.g. replaced with five or even ten of these less powerful devices. You see where I'm struggling? Tuning this well is like walking on a blade's edge. The whole idea behind it was that it would require constant player interaction to even operate, for example like constantly right clicking it, though that particular method is easily broken by mods adding fake player right clickers. A method could be that the UI includes a button that you have to keep clicking for it to tick it's progress. This way you cannot just spam the machine and walk away.